So much has happened in the last 8 days! 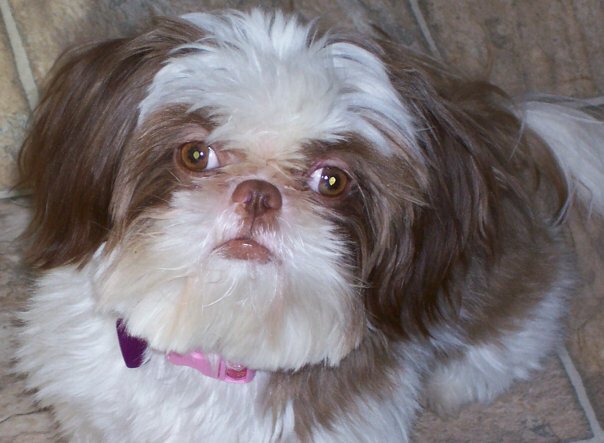 Monday was a week ago that Lucy (my furry little daughter) had an accident and cut the cornea of her left eye. We took her to the vet the next morning and were given meds to treat her with - hopeful that it would improve by her re-check a couple of days later. Long story short....it didn't improve and she had to have surgery to save her eye. That's bad enough in itself, but we were also leaving the day of surgery to go out of town over night for my cousin's wedding. She spent the night in the animal hospital and my in-laws picked her up for us and kept her until we got back home that evening. We were expecting improvement from there on out but things went downhill from there. Her pain never seemed to lessen and then we noticed something wrong with the other eye. A late evening visit with the vet turned into a 3 hour long trip to Atlanta for an emergency visit with Georgia Vet Specialists. By this point her breathing was very labored and she was in constant pain. They admitted her into their ICU unit and we were finally checked into a hotel nearby by 3:00 am. Lucy wound up having a similar surgery on the other eye yesterday, but is able to come home today! We will be leaving this afternoon to make the long trip up there and back. I can't wait to have her back home, but I'm really nervous about caring for her. She basically cannot see since both eyes have been operated on, so we will have to help her alot at first. I just hope her pain will be under control. That was the hardest thing to deal with before leaving her with the specialists in Atlanta. She was in horrible pain and no amount of pain meds seemed to help. On a more pleasant note........we had a good time at my cousin's wedding over the weekend. That was my first time going to Tybee Island. I'll post some pictures soon, but for now I wanted to post one of my Lucy girl. I know her eyes may never look like this again, but I can't wait to see that sweet little face and to see her eyes looking well again. She brings such joy to our lives!